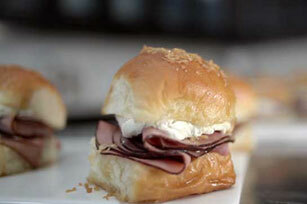 Spread cut sides of top halves of buns with cream cheese product. Fill buns with meat and Swiss cheese to make 12 sandwiches. Place in single layer in 13x9-inch pan. Mix remaining ingredients; pour over sandwiches. Cover with foil. Refrigerate 20 min. Heat oven to 350ºF. Bake sandwiches, covered, 30 min. or until heated through. Sandwiches can be refrigerated up to 24 hours before baking as directed.